What do Coca-Cola™, the United Nations, and Ford Motor Company have in common?University of Maine graduates havestarted their careers there. Other alumni have transitioned to prestigious graduate schools, including the University of Southern California, Emory University, and Harvard University.Within one year of graduation, 96% of UMaine alumni have secured jobs or are in graduate school. Students at UMaine choose from over90 majors and programs across fivecolleges, learning from some of the world’s leading teaching and research faculty. Top students at UMaine areinvited to join one of the country’s oldest and most prestigious honors programs, where students and faculty advisors work together on breakthrough research. UMaine is classified by the Carnegie Foundation for the Advancement of Teaching as a “Research University:High Research Activity” institution.The Laboratory forSurface Science and Technology is a hub for cutting-edge sensor and nanotechnology research,and our Advanced Structures and Composites Center is a global leader in deepwater offshore wind energy development. UMaine has the resources of a top national research university for one-third the cost of the average privateinstitution, which translates into a savings of tens of thousands of dollars. 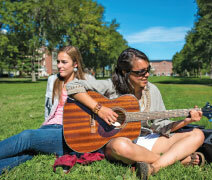 Each year, qualified new students at UMaine receive more than $15.8 million in grants. If you’re interested in medical,dental, or veterinary school aftergraduating, the University of Maine Foundation offers low-interest loans with deferred payments via the $12 million Charles E. Gilbert Loan Fund. Over the past few years, Bangor hasbecome a popular destination for travelers and Mainers alike. International music acts such as Darius Rucker, Ed Sheeran, Brantley Gilbert, and Arcade Fire have all performedas part of the Waterfront Concerts series. Bangor is also home to the American Folk Festival and the CrossInsurance Center, where the UMaine Black Bears basketball teams play. If you’re looking for a classic New England college town, Orono is it. Bike the trails, paddle a kayak or canoe on the Penobscot and Stillwater Rivers just steps outside your residence hall, or meet friends downtown. The Bangor Mall is also a short bus or car ride from campus. On campus, experience Broadway productions, play rugby, or become involved in one of more than 200 student clubs and organizationsand UMaine’s 27 fraternities and sororities. UMaine undergraduates have more than 400 options to study abroad, including travel study courses led byUMaine professors. UMaine undergraduates have extraordinary opportunities to take part in research and hands-on learning. Join SPIFFY, the student investment club, and help manage a $2.72 millionreal-money portfolio. 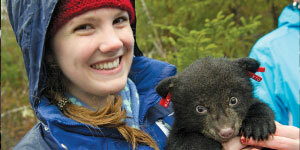 Study black bearcubs and track bear populations in the field as a Wildlife Ecology major. Train for a teaching career in urban, rural, and international classrooms. 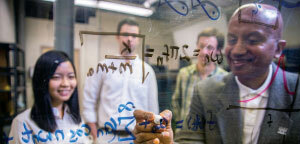 Engineering majors can choose from a network of established internships that often lead to employment aftergraduation. Regardless of your major,you will graduate with the skills andexperience employers demand. For complete information on how to apply, visit go.umaine.edu/apply.